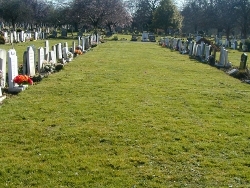 The chapel in East Sheen Cemetery can be used for burial services in Richmond Cemetery, and is suitable for people of all faiths and beliefs. If you are attending a funeral by car, please drive in through the East Sheen Cemetery entrance and park inside the cemetery gates. When the funeral cars drive through, you can follow them to the graveside. If there is a service in the East Sheen Cemetery Chapel before the burial, please park on the roads around the chapel building, making sure that the entrance to the chapel is kept clear for the funeral cars. You can then drive from the chapel to the graveside. East Sheen Cemetery Chapel has pushchair / wheelchair access and a wheelchair is available within the chapel, if required. An induction loop has also been fitted.